Legend of Zelda: Ocarina of Time might be more than a decade old, but Nintendo's 3DS remake is a great refresher. Some gamers might be upset by the Nintendo's focus on re-releasing Legend of Zelda: Ocarina of Time on the 3DS instead of something new. No, it's not a new experience, but after sitting down with it at the Nintendo 3DS event in New York, I found it to be a nice tribute to what many Nintendo fans call the greatest game of all time. Sure, I'll play it again. The N64 version of Ocarina of Time was released more than 12 years ago, so Ocarina of Time 3D might be the first experience with the title for many players. If you haven't seen any of the game's screenshots yet, Nintendo has significantly upgraded the graphics. The characters' visages are now expressive, rather than looking like Mr. Potato Head faces with eyes and mouths pasted on. Enemies, special effects, and even text boxes look better. 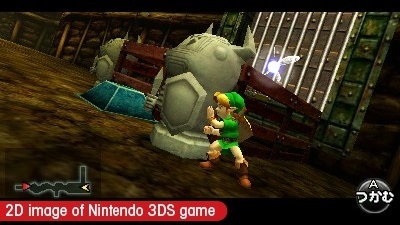 Overall, the visual change makes Ocarina of Time 3D shinier, and maybe a little more cartoony. It's as if some of Legend of Zelda: Wind Waker made its way into Ocarina of Time, but not to the extent that fanboys would complain. I'm not sure that the 3D effect makes that much of a difference, but it's neat nonetheless. The Jedi mind tricks of Nintendo representatives are stronger than mine, so I wasn't able to get them to confirm extra content, such as dungeons, enemies, items, etc. It wasn't denied, but I was told they weren't talking about it. The only content that will definitely be included is everything from the original Ocarina of Time. I spent some time checking out Kokiri Forest and the inside of the Deku Tree, slashing bushes, throwing rocks, and smacking Deku Babas with sticks. Yep, it's all there. 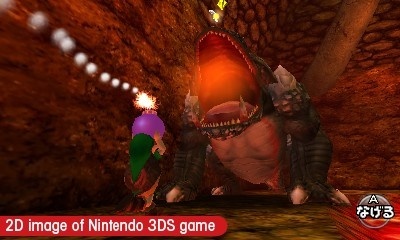 However, there are a few major additions that Ocarina of Time 3D brings to the table. The touchscreen enables the item screen to be right there at the ready at all times, so players can easily swap in new items without having to pause. This includes health potions, the slingshot, and everything else Link is known for. In addition, four items can now be queued up for quick use, as opposed to the original version's three. 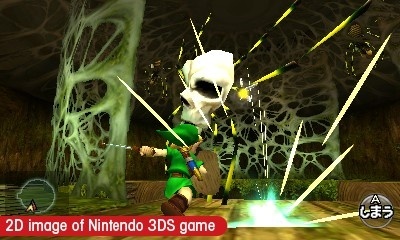 Ocarina of Time 3D also takes advantage of the 3DS's internal gyroscope. 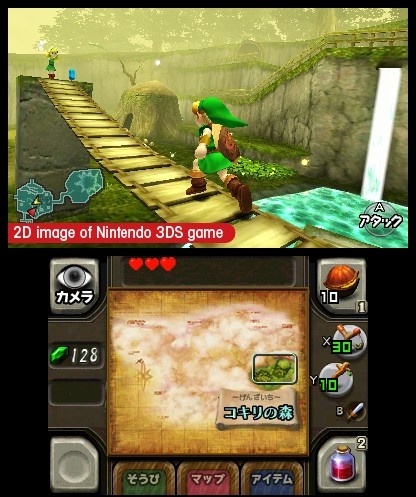 When players go into the first-person view mode, they can move the 3DS around and the camera will move throughout Link's environment, as if you're actually holding the sides of Link's head and moving it around. This feature also works when aiming ranged weapons, which didn't initially sound like something I'd use. It actually might work as well if not better than using the physical controls, as I was able to shoot down a bunch of Skulltulas (skull spiders) with ease, and it felt cool in an augmented reality sort of way. I'm definitely looking at Ocarina of Time 3D through the eyes of nostalgia, because I haven't played the original game in years. 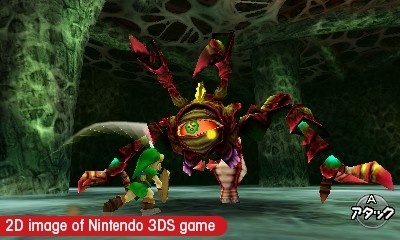 As such, I think it would be fun to play it again with its upgraded graphics and features on the 3DS. Plus, you never know, Nintendo might be working on some bonus content that the Force was hiding. On the other hand, if you just played Ocarina of Time yesterday, it might not be as attractive a title.